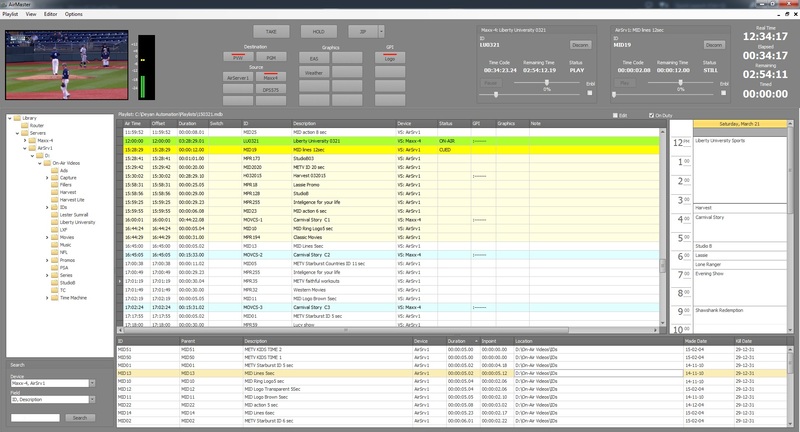 AirMaster is a playout application with an unmatched reliability and ease of use that our clients occasionally leave unattended for three days at a time. It’s an intuitive software only automation solution that unites all functions necessary for on-air playout into a single application. It is capable of playlist control, playout device control and database management, therefore keeping the system design as simple as possible. Control of devices is achieved by using com ports or TCP/IP to com port converters, hence there is not proprietary hardware involved. AirMaster is also handling video servers from different manufacturers on the same playlist. It is delivered with EditMaster, a separate playlist scheduling application, which can interface to traffic applications from different providers.